According to trainer Peter Fury, who guides both heavyweight champ Tyson Fury and his son, unbeaten heavyweight contender Hughie Fury, Mexican/American contender Andy Ruiz Junior has pulled out of his scheduled October 29 fight with Hughie. The fight, a very interesting and intriguing one between two young and talented big men, was to have been the chief support to Fury-Klitschko II in Manchester. However, according to Peter, who took to social media earlier today, the fight is now off as Ruiz Jr has pulled out for as yet unconfirmed reasons. 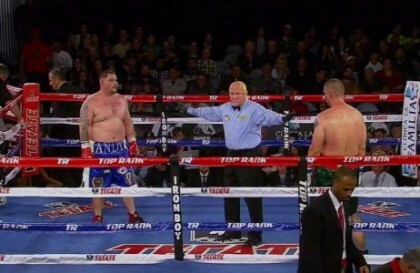 “Andy Ruiz Junior pulls out of fight October 29th. News just in today,” the trainer wrote this morning UK time. Ruiz, who looked trim and fit in out-pointing veteran Franklin Lawrence just 11 days ago, September 10, has previously pulled out of a fight for basically unknown reasons. The 29-0(19) contender withdrew from a fight this past January, with the official reason being he “wasn’t mentally where he needed to be to fight.” Ruiz is a good fighter, who has fast hands and decent power, yet he never really seems to want to take that step up in class. Not that Hughie Fury is a proven top-10 fighter; he too needs to step up in class. But the young Fury very much wants to do this and the Ruiz Jr fight was definitely a step in the right direction by both men. According to reports, Hughie, who is unbeaten at 20-0(10) will still appear on the October 29 card, but now a new opponent is obviously needed. Let’s all hope the main event does not collapse as some fight fans fear could be the case. It’s tough not to feel bad for Hughie right now though. The Furys, along with promoter Frank Warren have great belief in Hughie, but it seems that for one reason or another he has a very hard time getting quality fighters to agree to face him.